Laherte Frères has 10+ hectares of grapes, half of which they grow biodynamically and the other half which they farm organically. The vines are scattered in 75 parcels, an amazing amount, over 10 villages. 7th generation son Aurélien Laherte is very interested in and driving the natural growing movement at Champagne Laherte Frères. However many of the plots are simply too far away to easily grow biodynamically as it is very labor and time intensive. Fortunately a great number of their holdings are close. Primarily on southern slopes near Epernay they grow Pinot Noir, Pinot Meunier, and Chardonnay in the communes of of Chavot, Courcourt, Mancy, Moussy, Vaudancourt, as well as Epernay. Also, in Chavot, in a plot called Les Clos they grow in addition the ancient Champagne grape varieties Arbanne, Petit Meslier, Pinot Blanc and Fromenteau (Pinot Gris) which they field blend to produce a cuvee which is called Les Clos. They also grow 1er Cru Chardonnay in the Côte des Blancs within Vertus and Voipreux, and Pinot Meunier in the Vallée de la Marne in Le Breuil and Boursault. They use a lot of Pinot Meunier in their blends, make two all Meunier wines, and also several Blanc de blancs - an unusual lineup! They were founded in 1889 and for many years sold grapes to the local co-op. Although I consider them a Grower Producer as do most Champagne aficionados, technically they are a Negociant as different family members have legal ownership of their various plots of vines. In the cellar they have no rules other then pressing the grapes very quickly as they come in with two traditional Coquard presses. Usually about 70% of the wines are vinified in oak barrels or in larger wooden foudres, and some in steel. Younger vines tend to have yeast added, while older vines more commonly only use naturally occurring yeasts. There may or may not be Malolactic fermentation, although commonly in it used for Chardonnay but not Pinot Noir and Meunier. Brut Tradition NV - 60% Pinot Meunier, 30% Chardonnay and 10% Pinot Noir with 40% reserve wines added. Brut Rose NV - 50% Pinot Meunier, 30% Pinot Noir, and 10% Chardonnay with 8-12% still red Pinot Meunier added. Blanc de Blancs Brut Nature NV - made from their best Chardonnay with 50% reserve wines. Millesime - Their vintage wine which uses 85% Chardonnay and 15% Pinot Meunier from their oldest plots, barrel fermented, with low dosage and no malolactic fermentation. Les Empreintes - an all Chavot terroir wine made of the three main grape varieties with no added dosage. Les Grapes Dorees - an NV wine with 100% Chardonnay from the Côte des Blancs. Les Vingnes D'Autrefois - old vine (1947 to 1953) Pinot Meunier, some of which is planted on other grape stock. Les 7 - this wine uses all 7 allowable grape varieties: 8% Arbanne, 10% Fromenteau, 14% Pinot Noir, 18% Chardonnay, 17% Pinot Blanc, 18% Pinot Meunier and 15% Petit Meslier. It is fermented naturally, and made solera style with 60% new wine added to the 40% remaining wine from previous years blends. A most bizarre and unusual wine - glad to try it. 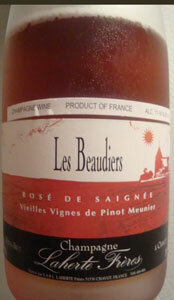 This is a 100% Pinot Meunier Rose, which is quite unusual. 100% Pinot Meunier anything is unusual. It is made from old vines from the village of Chavot planted in 1953, 1958, and 1965. The color is a rich red with some orange. My notes, scrawled on an envelope, read "blood red orange juice with some copper color" but I realize most people haven't seen blood red orange juice, hence the pictures. Note the bottle has condensation on it dulling the color somewhat. This wine starts quite strange although pleasant and then gradually opens out and becomes more pleasurable. The nose has sweat and some red fruits, perhaps strawberry. As it warms it gets a nice sweetness to it. The palate starts earthy and nearly metallic, sweaty and slightly maritime in nature. As it warms and breathes, strawberry and maybe some plum. It is concentrated and retains its slight metallic edge with a bit of bitterness. Its concentration is admirable and I can't help to think this is a wine they make "because they can." I'm looking forward to trying another bottle. This I believe is one for Champagne geeks like me.